Jock enthusiasts, sports fetishists, and sweaty man-scent lovers can rejoice in this locking athletic-cup jock muzzle. 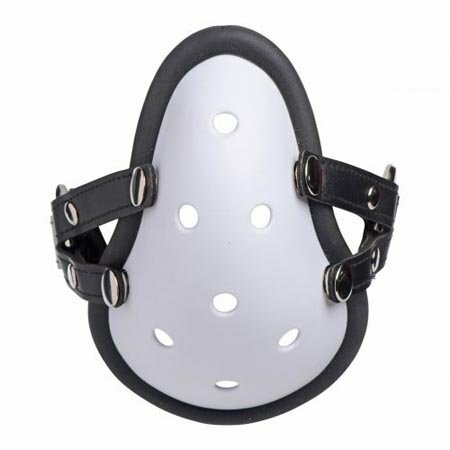 Jock enthusiasts, sports fetishists, and sweaty man-scent lovers can rejoice in this athletic-cup jock muzzle. The comfortable silicone-lined athletic cup unsnaps from the straps so that you can wear it during the game, then force your sub to inhale your scent afterwards. Or stuff the cup with a used pair of socks or underwear-- whatever floats your boat. The straps adjust to fit most and are equipped with a locking buckle. Measurements: Athletic cup is 6.5 inches in length, 4.5 inches in width. Straps adjust up to 26 inches in circumference. Materials: ABS plastic, silicone, faux leather, nickel-free metal.